There are also similar functions for single spans (SSSpanU) and cantilevers (CantileverU). FEAU and REAU find fixed end moments or restrained end moments for a single span with fixed ends or spring restrained ends. The beam may have any number of segments with different section properties. The BeamAct3D function returns beam actions and deflections along the beam, for a beam with any number of segments and specified end conditions and applied loads. 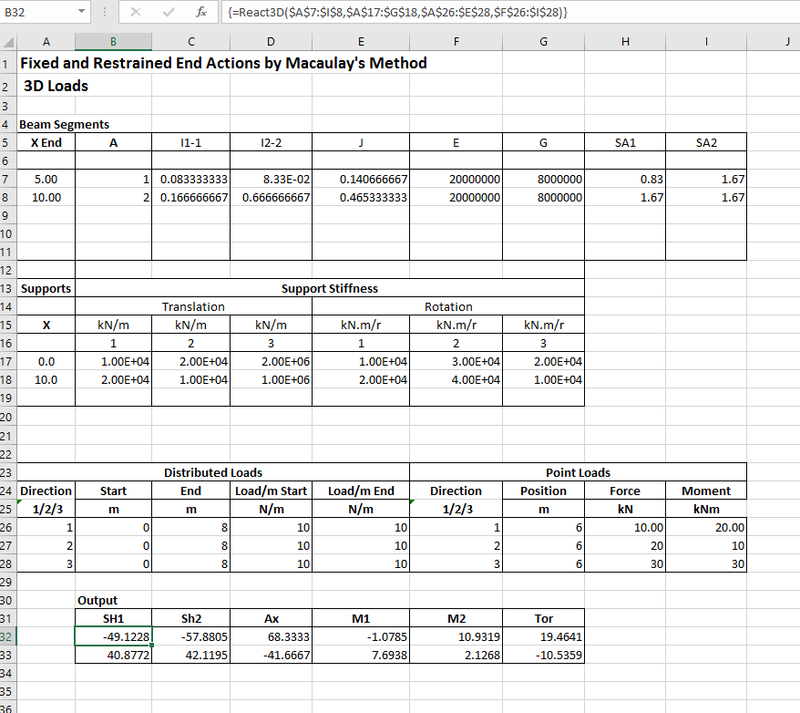 Download the spreadsheet for more details of each function, and information on using array functions. 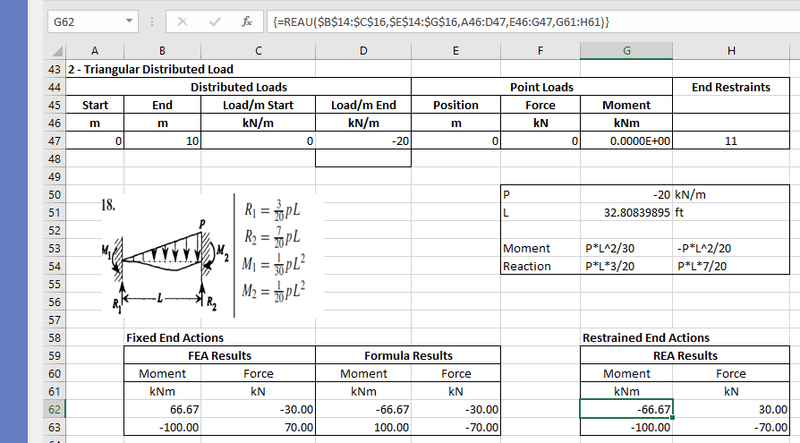 This entry was posted in Beam Bending, Excel, Finite Element Analysis, Frame Analysis, Newton, Strand7, UDFs, VBA and tagged ConBeamU, continuous beam analysis, Excel, Fixed End Moments, moving load, Restrained End Moments, Strand7, UDF, VBA. Bookmark the permalink. Hi Doug. Are you still using FormulaDesk to create your math equations? Hi Gareth. I’m not really using it at the moment. I’m still interested, but I’ve just got too many other things I’m working on at the moment. The equations in this post are just scanned images from books. If I had export full functionally function conbeam (not conbeamU), wich modul could I get? In “Continuous Beam Analysis by Macaulay’s Method” the field “Section/Span” what does it do? The simplest thing to do is to save the spreadsheet with a new name, and just delete the sheets you don’t want. If you don’t want to use the units functions you could open a blank workbook, save as xlsb or xlsm, and copy across the VBA modules. You can drag and drop in the VB Editor. Conbeam and ConbeamU are both in the same module. You won’t need the Units module if you don’t want to use ConbeamU, but the safest thing is to just copy all of them. If you do want to use the units at any time, the units data is in a worksheet and uses named ranges, so you need to use a copy of the original file. Tahnk Dougaj4, I understood this. But… the 2nd question about the field Section/Span. How can we use that one? It returns results at however many sections you specify for each span. You can enter a single number, and get the same number of sections in each span, or enter a number for each span. The alternative is to list the position of each section where you want results, then set the ListOutPoints argument to True or 1. See the ConBeam Check sheet for an example where the output point positions are listed, and the ConBeamU sheet for the number of sections in each span, with ListOutPoints omitted. Wow. 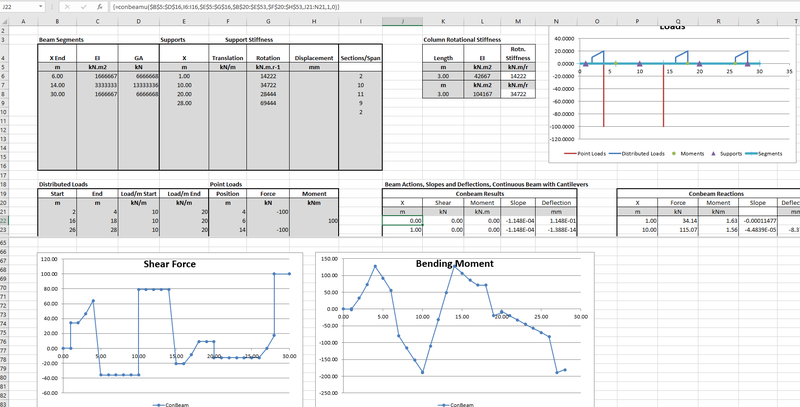 I just stumbled across this while researching to develop a similar spreadsheet myself. I’m so glad too, as I am looking for functionality to accommodate a variable number of spans, support displacements, and shear deformations – all features that would have taken a long time to implement robustly. Thanks Doug; you just saved me a ton of time and heartache! I’ll dig in to it properly when I have time, and will let you know if I think of anything that might be worth incorporating, though it looks like over the years you’ve grown this in to a very powerful tool with most of the bells and whistles that I had been dreaming of. Great work. Thanks for sharing! Thanks Dan. I’d certainly be interested to hear if you have any suggestions for improvement. But I become an error 1004 because the Range method doesn’t work to call all these cells. Have you any solution to solve the problem ? Thanks for letting me know. I’ll have a look and reply here. If you could send your copy of the file to my gmail address (dougaj4), that would be helpful. I have now had a look at my master copy of ConbeamU, and I don’t get the problems you describe. This makes it difficult to find the source of your problems, but I will be happy to look at your copy if you send to GMail (Dougaj4@….). Download the file again, and make sure you have the latest version (4.10	23-Aug-16, see the “about” sheet). – Go to the VBA code and insert a breakpoint near the start (but not on a Dim statement line). – Return to the spreadsheet, select the cell at the top-left corner of the PlotMom output, press F2 (to enter Edit mode), then press Ctrl-Shift-Enter, to re-enter the function. The VBA code should appear, with the break line highlighted. You can then step through the code by pressing F8. I’m testing “ConBeam” version 4.10 (not ConBeamU). In the example that I am checking I considered a beam with two supports and a cantilever.I noticed that any negative value in “support rotational stiffeness” gets a rigid hinge, not only the value “-1”. But it’s non a problem, it’s ok. The problem is with what follows. If in “support rotational stiffeness” I enter positive values gradually increasing (eg 100, 1000, 10000, etc. ), then in the “support” moment I get values gradually increasing, as can be expected, to the limit to get an infinitely rigid hinge. But I do not understand why if I enter very small but positive values (for example 0.00000000000000000001) in that “support” I get very high moment values, values which among other exceed the maximum expected moment. I hope I explained myself. There is an error or I interpret bad the meaning of “support rotational stiffeness”? The unit should be moment/radians (but in sheet “Function” you write “radians/unit moment”); is not it? I tested it also with an older version of “ConBeam” (Macaulay.xlsb version 1.11), and this problem did not manifest itself. Last but not least, I wanted to congratulate you for your immense work. Hi Alberto, thanks for the feedback and comments. For a rigid hinge, yes any negative value will be treated as rigid. The problem with vey small rotational stiffness values is due to floating point problems in the REA function (Restrained End Actions), which is called from SSSpan, which is in turned called from Conbeam. If the end supports have a very small stiffness it generates very big rotations when the beam is analysed as a cantilever, which results in the numerical problems. I have fixed that by setting the rotational stiffness of the end supports to zero for any value less than 0.001. For the rotational stiffness units, yes you are right, it should be moment/radian. 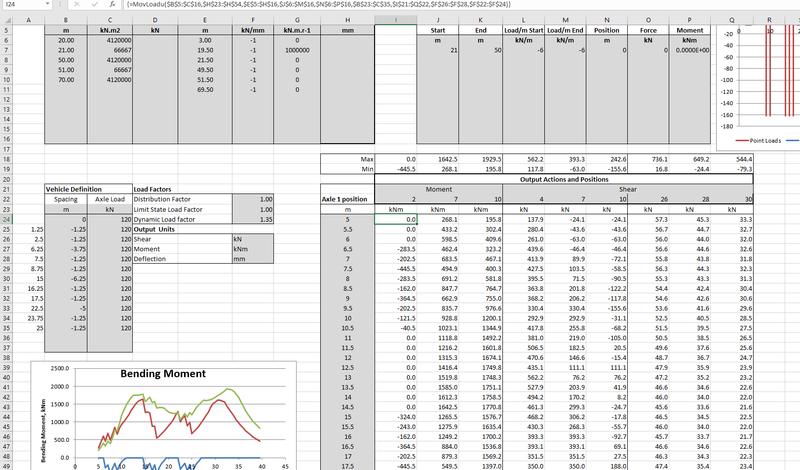 I have corrected that, and also made some other minor changes on the Functions sheet. There is also another problem that I have recently fixed, so I will upload the new version (4.11) today, and write it up in a blog post in the next few days. Hi Dougaj4. Thanks to me? Thank to you for your great work and for sharing! 🙂 ConBeam is very useful in my work. Hi Dougaj4. I have tested “ConBeam” version 4.11 (not ConBeamU). Now it works correctly. I report (for non-experts, like me) that in VBA, Tools, Reference, must have checked (among others): “Microsoft Scripting Runtime”. Great work Dougaj4! Thanks again. I just found today that 4.11 was not working correctly for fixed rotational restraints. I have just uploaded ver 4.12 with that problem fixed. Thanks to you. In tests I had done I had not noticed. Excuse me dougaj4, where could I found ver 4.12 ? The link at the top of the page downloads the latest version. Hi Doug, thanks for your great work. 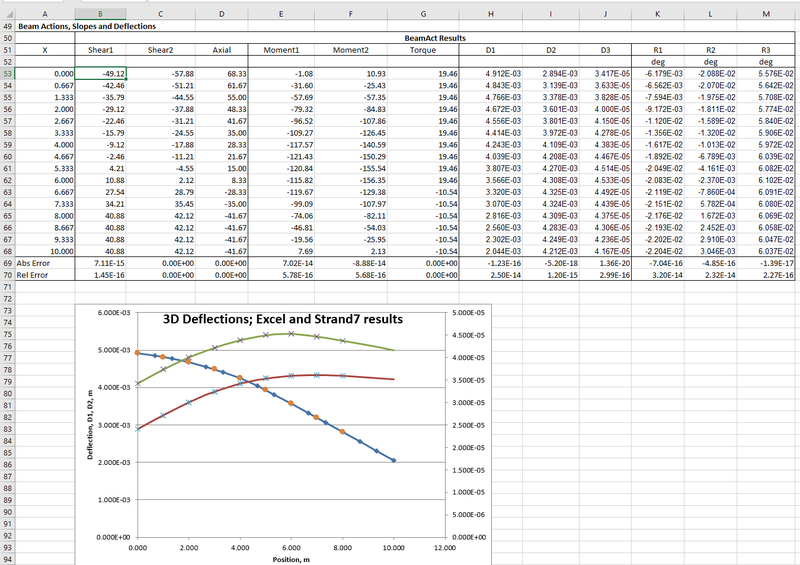 I am analyzing a simple beam and having trouble with reading out BM and deflection at particular points (beam end segment). On Functions tab, Macaulay function, Out=3 should give me Shear and BM at ends of each segment. However, #Value! error appears when I specify Out=3. Have you had any solution to this? Thanks!